The Solo Club is a decorated 'one piece' club. This has a few advantages - it's tough and affordable! These solo clubs are ideal for learning the fundamentals of club juggling. Each club is decorated with mirrored 'Euro' style decoration and has a bulbous 'swinging' knob included as part of the handle. 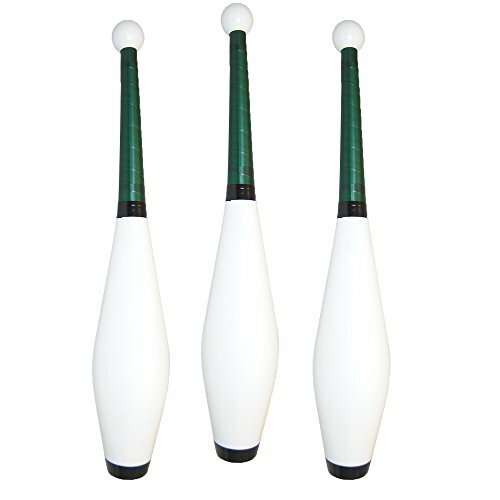 Solo clubs are a little light for outdoor juggling but the perfect prop for your first steps in club juggling and swinging. 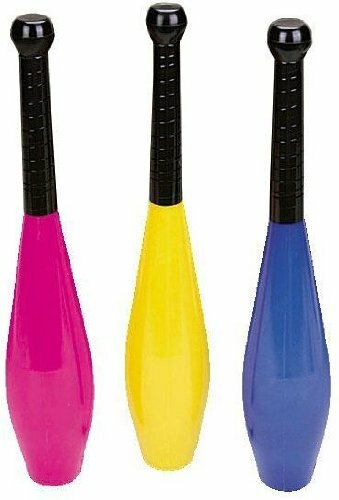 Juggling Clubs are what every juggler strives to accomplish, and this set of 3 brightly colored clubs provide an excellent opportunity to work up successfully. Foam Clubs are 18 in long and made of neoprene foam with textured handles. 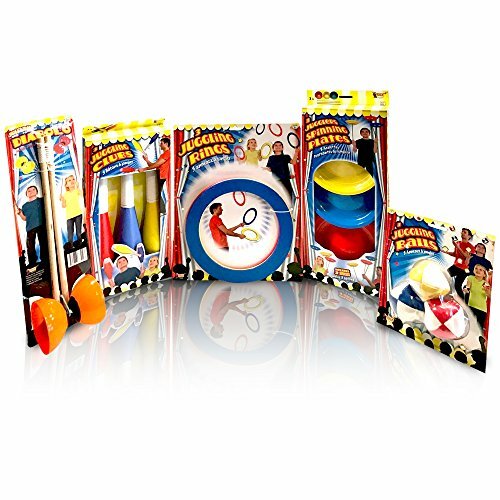 Set includes instructions and 3 Juggling Clubs with one in each color: Pink, Yellow and Blue. 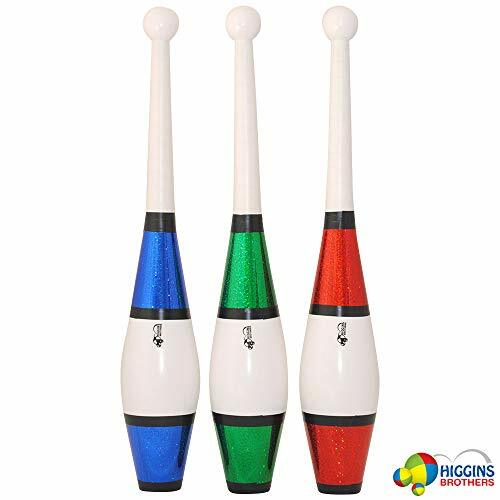 This is a set of Three Clubs - Colors vary.The Pegasus is a nicely balanced, slightly light weight performance club.Made with a multi-piece design, these clubs have a handle that flexes over the inner dowel for a perfect feel to the hand. The Pegasus has a sturdy rubber knob and rubber cap. The body is durable and scuff-resistant, and these come in assorted foil and tape deco designs.These clubs are sold as a single club and also in sets of 3 or more at a discount off the per-club price.Specs:Length: 20.5 inches;Weight: 200 grams. 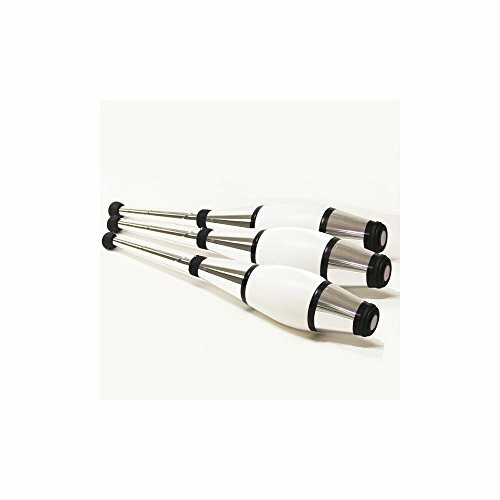 Durable polyethylene clubs with soft knobs and butts, taped handles for a great grip. 19'' long, 8oz Sold Individually Please note: If there is a color/size/type option, the option closest to the image will be shipped (Or you may receive a random color/size/type). 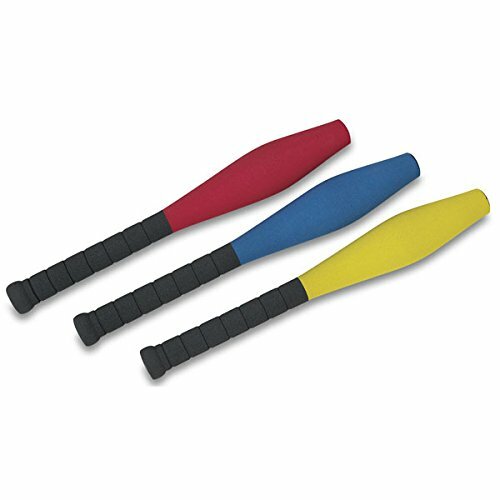 MAC-T PE09133 Foam Juggling Clubs (Pack of 3), 18"
Set of 3 lightweight, durable foam juggling clubs. 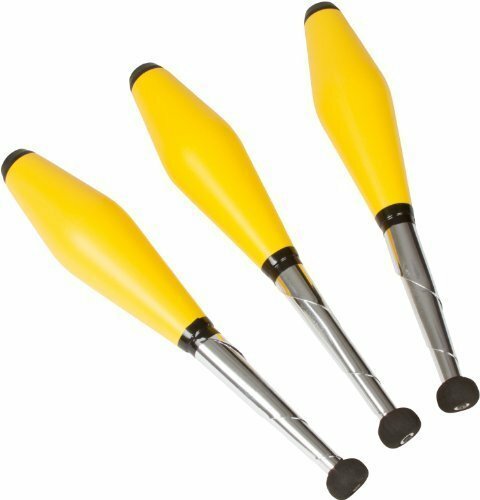 Set of 3 one-piece juggling clubs with a colorful wrapped handle. Each club is constructed in one-piece style for durability but unlike other one-piece clubs, the plastic is softer than other rigid plastics for a more enjoyable juggling experience. 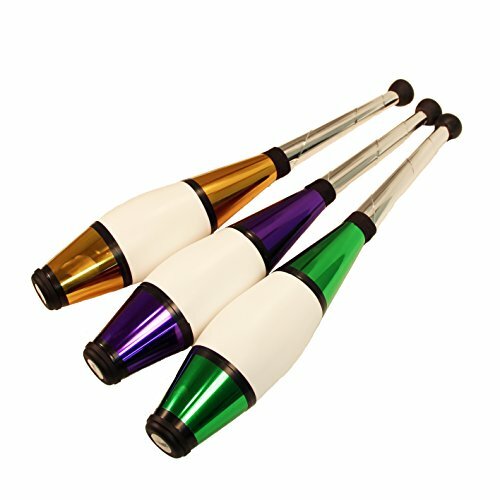 For additional comfort and grip when juggling, each handle is wrapped in white tape and has a rounded knob at the end which is also useful for club swinging. Each club is 19.5 inches long and weighs 195 grams providing an ideal weight for spin that matches more expensive composite juggling clubs. The set of 3 comes packaged in plastic packaging with a header card making them good for gift giving and protecting them from being damaged in shipment or storage. 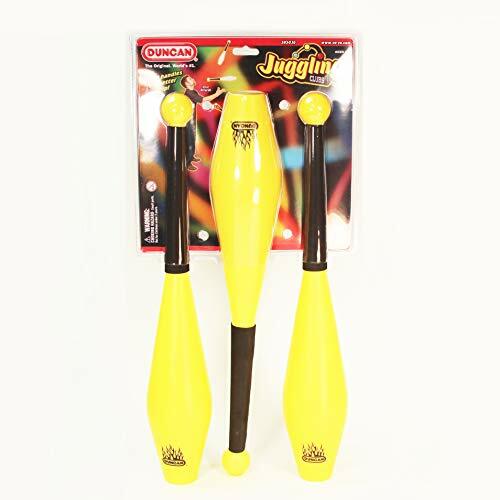 This Duncan Juggling Club Set comes with three expertly balanced, full sized, durable, full-sized juggling clubs. 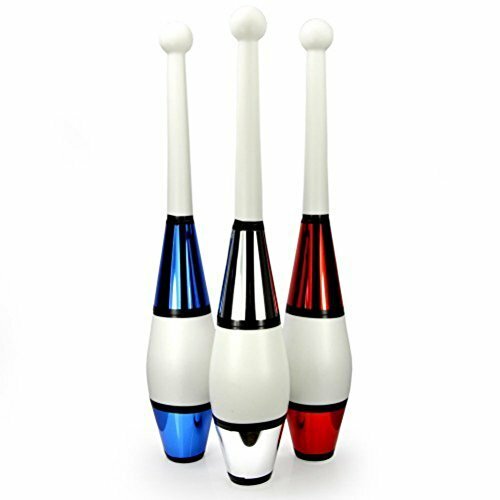 This is an excellent product for jugglers who are just starting out. The graphics may vary. Set of 3 one-piece juggling clubs with beautiful euro-style glitter decoration for maximum visual effect. Each club is constructed in one-piece style for durability but unlike other one-piece clubs, the plastic is softer than other rigid plastics for a more enjoyable juggling experience. 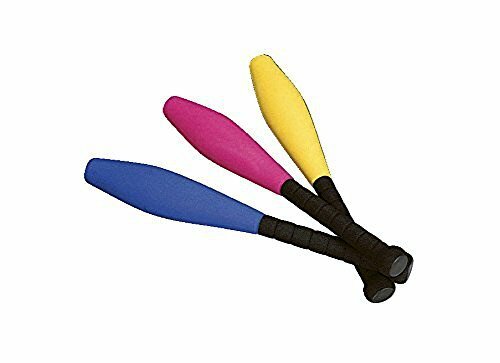 For additional comfort and grip when juggling, each handle is wrapped in white tape and has a rounded knob at the end which is also useful for club swinging. 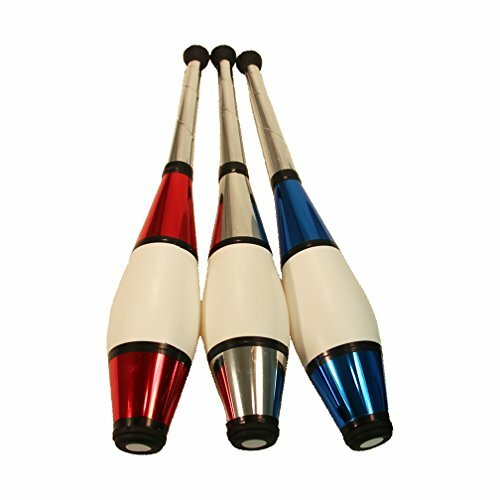 Each club is 19.5 inches long and weighs 198 grams providing an ideal weight for spin that matches more expensive composite juggling clubs. The set of 3 comes packaged in plastic packaging with a header card making them good for gift giving and protecting them from being damaged in shipment or storage. This is our best selling club. The Zeekio Pegasus Clubs gives you all the performance and feel of the high priced clubs but at a price that won't make you scared to drop it.With a traditional shape the Pegasus Clubs are made with a multi-piece design, including a wrapped handle that flexes over the inner dowel for a soft landing and perfect feel in your hand.The body is white PVC that is scuff resistant and retains its shape even under tough long term use. The Pegasus has a sturdy black rubber knob and rubber base cap.Specifications:● Composite Design● Length: 20.5 inches● Width at widest point 3 3/8"● Weight: 200 gramsNote: Colors vary!This is a set of 3 clubs. Also available individually. 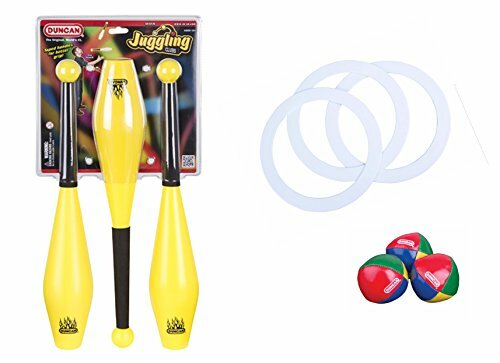 Juggling Balls, Juggling Pins & Juggling Rings Juggling Combo With this set you be ready for any juggling show. 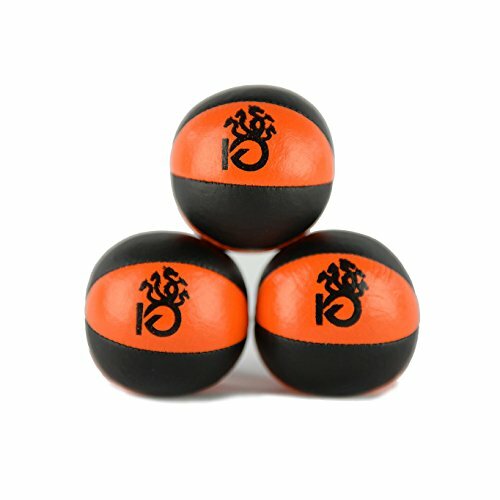 This set includes 3 juggling balls 3 juggling pins and 3 jugging rings. 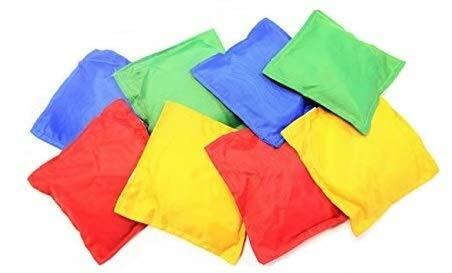 Toss some fun into your backyard picnic or a carnival themed birthday party with Nylon Reinforced Bean Bags. These sturdy little bags are great for all kinds of party activities. And they're not just for carnival games. Great for teachers and parents alike. You can also create your own games using these vinyl covered bean bags. 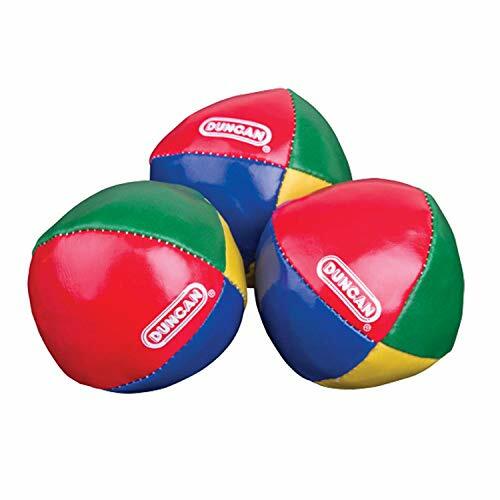 The possibilities are endless Use these for a bean bag toss into a hula hoop target or knock down some metal cans. Perfect for all occasions. Adults and kids love playing corn toss at barbecues, tailgates, reunions Birthdays and more. NOTICE: The "Oojami" seller is the only authorized seller, we do not sell wholesale so there should be NO other sellers; Any other sellers are illegally selling their own products using our registered Trademarked company name. In this listing, purchasing from any seller other than "Oojami" will result in a potentially faulty product that may be unsafe and cause injury. Please be sure to purchase this product from the "Oojami" seller to avoid any problems with your product and to ensure both your safety and satisfaction. Catalog/Kids, Baby & Toy/Toy/Hobbies, Butterfly Xt Yo-Yo-Multicolor, Pid: 071617023782, Ship To Us Only. 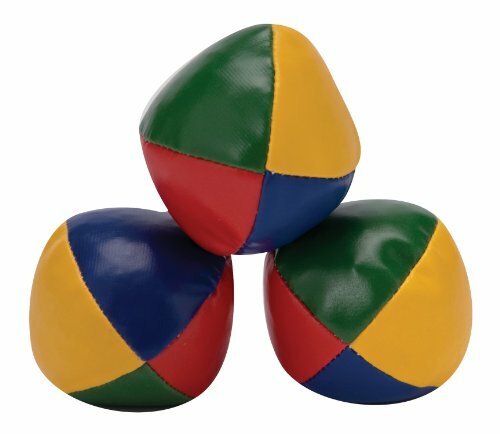 Learn the timeless art of juggling with the Classic Juggling Balls from Schylling Toys, the world leader in traditional Toys and classic fun. The set is three vinyl covered, bean filled balls perfect for the beginner. The multi-colored balls are 2.5 inches in diameter, just the right size for learning the craft. Included is a detailed instruction book to help you quickly master the art of juggling. For ages 5+. Juggling Rings. Set of 3 - In Red, Yellow, and Blue. Practice Your Juggling today. By Trademark Innovations.